Northwest Semitic is a division of the Semitic languages comprising the indigenous languages of the Levant. It would have emerged from Common Semitic in the Early Bronze Age. It is first attested in proper names identified as Amorite in the Middle Bronze Age. The oldest coherent texts are in Ugaritic, dating to the Late Bronze Age, which by the time of the Bronze Age collapse are joined by Old Aramaic, and by the Iron Age by the Canaanite languages (Phoenician and Hebrew). Brockelmann's Canaanite sub-group includes Ugaritic, Phoenician and Hebrew. Some scholars would now separate Ugaritic as a separate branch of Northwest Semitic alongside Canaanite. Central Semitic is a proposed intermediate group comprising Northwest Semitic and Arabic. Central Semitic is either a subgroup of West Semitic or a top-level division of Semitic alongside East Semitic and South Semitic. SIL Ethnologue in its system of classification (of living languages only) eliminates Northwest Semitic entirely by joining Canaanite and Arabic in a "South-Central" group which together with Aramaic forms Central Semitic. During the early 1st millennium, the Phoenician language was spread throughout the Mediterranean by Phoenician colonists, most notably to Carthage in today's Tunisia. 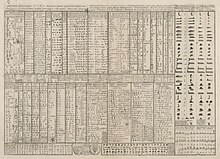 The Phoenician alphabet is of fundamental importance in human history as the source and ancestor of the Greek alphabet, the later Latin alphabet, the Aramaic (Square Hebrew), Syriac, and Arabic writing systems, Germanic runes, and ultimately Cyrillic. After the Muslim conquests of the 7th century, Arabic began to gradually replace Aramaic throughout the region. Aramaic survives today as the liturgical language of the Syriac Christian Church, and is spoken in modern dialects by small and endangered populations scattered throughout the Middle East. There is also an Aramaic substratum in Levantine Arabic. ^ Hammarström, Harald; Forkel, Robert; Haspelmath, Martin, eds. (2017). "Northwest Semitic". Glottolog 3.0. Jena, Germany: Max Planck Institute for the Science of Human History. ^ Aaron D. Rubin (2008). "The subgrouping of the Semitic languages". Language and Linguistics Compass. 2 (1): 61–84. doi:10.1111/j.1749-818x.2007.00044.x. ^ Kurzgefasste vergleichende Grammatik der semitischen Sprachen, Elemente der Laut- und Formenlehre (1908), quote "Das Westsemitische gliedert sich in zwei Hauptgruppen, das Nord- und das Südwestsemitische... Das Nordwestsemitische umfaßt das Kanaanäische und das Aramäische...Das Südwest semitische umfaßt das Arabische und Abessinische." ^ "Semitic". Ethnologue. SIL International. Retrieved 2014-06-02. ^ Kootstra, Fokelien. "The Language of the Taymanitic Inscriptions and its Classification".